Mawarra Diamentina: Diamentina was purchased for $9,000 at the 2016 Herefords Australia National (Wodonga) by Alan Mitchell, Wonthaggi. Alan’s business was featured in a recent Client Focus video, which can be viewed on the ‘Share Your News’ page of our website. Diamentina is a moderate sire and has bred exceptionally well for us. His progeny show explosive growth to 400/600 days, eye appeal, do-ability and industry-leading IMF. His maternal line is proven, and we are excited to have 10 young daughters in herd. We have retained his son, Flying Start (see Future Sires), and his first calves show great potential. Diamentina boasts an excellent EBV spread; top 1% Rib & Rump, 5% EMA & IMF, 10% GS, 15% GN and 20% 400D, 600D, SM & EU. His 17 calves, at Mawarra, have recorded an average birth weight of 38kgs. 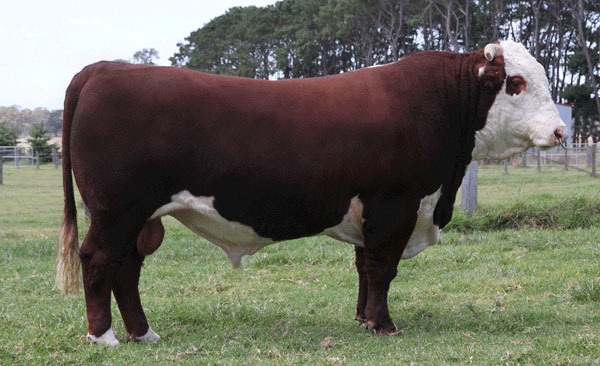 His first three sons sold to $14,000 (Foreman, 2018 Herefords Australia National [Wodonga]), and he is represented by another son in our 2019 Sale, see Lot 36.